Rarely do you get the chance to work on a project with national impact. But that’s what happened when Comic Relief asked us to scale up the HIV test booking application we made with Yorkshire MESMAC. So far it’s been a success and Metro, one of the project partners, have begun modelling their London HIV testing service and its future funding requirements around it. 10pm-2am. Weekends especially. The most common time for wanting to book a HIV test. But also when services are closed. You feel anxious and distressed that you can’t take action now, that you’ll have to wait until Monday. It’s not hard to understand how reassured you’d feel if you could book a test there and then, before you try to sleep. Our discovery work had also found that people are more likely to book a test if they can do it there and then, rather than beginning the process again when services opened. And we found they’d prefer to book online rather than by phone or dropping in. We knew all this because in partnership with MESMAC we’d started solving the problem for people in Yorkshire. We’d researched, tested a hypothesis and built a public prototype. MESMAC’s bookings had already increased by 57%. It was time to go national. MESMAC knew no other online HIV test booking system existed, and that generic booking solutions lacked usability. Comic Relief’s Think Digital HIV fund seemed the ideal opportunity to team up again. Together we made a plan and wrote a 1800 word application for ‘Book-a-test’. The fund received 25 applications for 10 grants. We got shortlisted, interviewed, then chosen. Comic Relief also got the Centre for Acceleration of Social Technology (CAST) involved. The CAST team acted as critical friends to the project, always ready to support and challenge our methods, processes and findings. We always talk about user needs. But often services have multiple users, including the staff who run them. These staff are actors in the process so their needs need understanding too. In this case we had a prototype that was working well for end users. They could book quickly, easily and anonymously from any device. But behind the scenes MESMAC staff were required to manually copy appointment info to their own calendar. 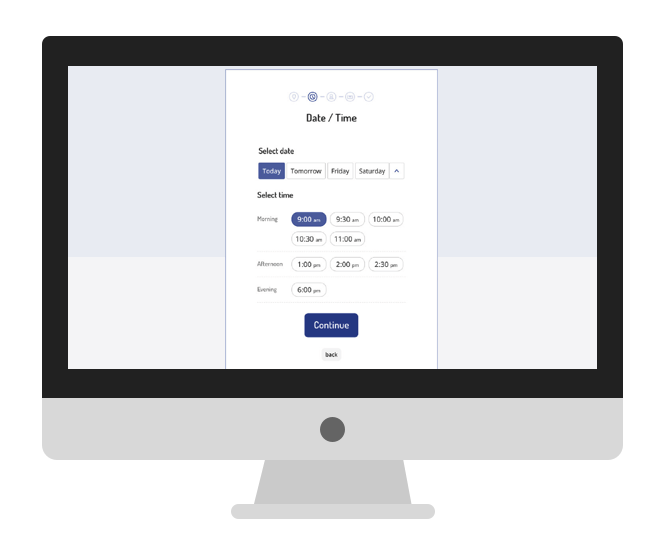 To make Book-a-test meet their needs we needed to improve and automate these behind the scenes processes. The application also needed an ‘API’, a set of specific functions that would make it easy to integrate with other services’ existing websites and systems. And we needed to build each element of the system as an open source product, so other organisations could use them for their own booking system. Not only that but Book-a-test would need maintaining post-launch. Because we really believed in it we have commited over £20k of Ayup time to support it over two extra years. We already had lots of data on how Book-a-test was being used. Knowing this made it easier to focus discovery work on the workers who’d be using the behind the scenes system. We met 28 of them through a mix of workshops and 1-1 interviews at Metro in London and MESMAC in Yorkshire. We learnt how they currently handle bookings, what annoyed them, and what worked well. This generated a rich tapestry of data that we turned into a set of personas and a service blueprint. The blueprint laid out all insights, problem points, and opportunity areas and showed how they related to one another. Seeing these relationships clearly laid out would improve our design decisions and make it easy for MESMAC and Metro’s project leads to be involved. Here’s where our design work began. 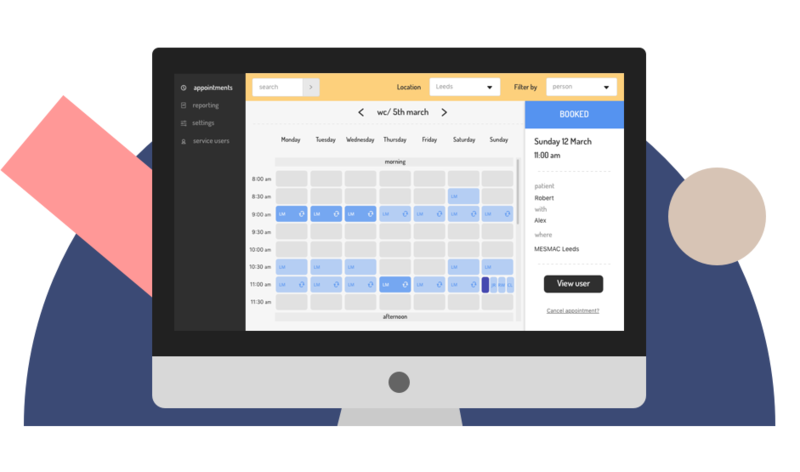 Using the blueprint we overlaid it with a prospective user journey - a description of how test booking could work with a system to manage bookings. Using the journey’s insights to guide us we wrote 50 user stories with MESMAC and Metro. Each story described a specific need and rationale from a user’s perspective. Next we prioritised the stories and built a clickable prototype around the most important ones. Over the next six weeks we tested it remotely with MESMAC and Metro staff. The test sessions overflowed with insight and learning - we were ready to build a beta. The beta stage is always exciting. You get to see what has up until now been a tangle of needs, ideas and insights transform into a living, breathing product. In this case the beta had three parts: A front end interface based on the existing application but also embeddable into other websites and applications; a back end admin portal for staff and clinicians to manage bookings and do not attends; and an API to enable the whole system to integrate with other websites, platforms and systems (e.g. chatbots). We've also built a small marketing website giving access to the open source code, so others can reuse and add to it. The Book-a-test admin portal will enter public beta in January. At the same time we’ll be delivering show-and-tells to Metro and MESMAC staff, helping them get used to using it. It’ll go fully live in March 2019. Beyond then we’ve committed to two years of maintenance support and product improvements. MESMAC and Metro’s experience will drive these changes and we hope to get feedback from other organisations who use the system too. It’s too early to measure the new system’s impact. But staff feedback has been continuously positive and they’ve responded to beta plans with enthusiasm. When we did our first Metro show-and-tell their staff declared it as “awesome” and “brilliant”. They were buzzing with excitement. This enthusiasm is vital, because the system will change their working culture and support both organisation’s digital transformation objectives. It’ll show the everyone how tech can make behind the scenes processes more automated and efficient, and how it can make user experiences simpler, more reassuring and stress-relieving. Want us to come and share what we learnt with your team? Or talk to us about a different project?